Here is a selection of some of the planes that Keystone produced for their ships and Coast Defense Forts. They measure 3.5 inches long with a wingspan of 3 inches. The body of the plane in wood and the wings are metal. Some have a rubber bumper on the nose. I currently do not know the years that the rubber bumper planes were produced. Starting on the left is the U.S. Mail plane which is one of the rarest planes as it only came with model the #216 Passenger liner and the #652 Convoy Fleet (with the Passenger Liner). The red and silver planes with the star wings are the most common as they came with most ships and the Coast Defense Forts prior to 1942. The gray U.S. Navy plane is definitely from the war years. 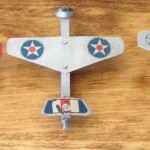 It first appears in 1942 and has fiberboard wings instead of metal. This plane with the fiberboard wings is the rarest because the wings were fragile and broke easily. On the right is the U.S. Navy plane in yellow. I do not know why they are yellow and what model they would have come with. I have only seen two of these and I have them both. Are they rare? As of now yes but we will see how many surface. Overall these planes are one on the hardest parts to find. They were one of the first parts to get lost along with the missiles that fired out of the various cannons.